Only Mitsubishi would have the gall to call its new electric SUV concept an e-Evolution. Sure, it’s not a Lancer Evolution, but having the word ‘Evolution’ in a car with a Mitsubishi badge raises certain expectations. And now it’s on this storied but troubled company to meet them. Mitsubishi will tell you this is an evolution of the SUV as we know it. It’ll also tell you the company has been making these things before the term “SUV” was even used. Oh, and it was ahead of the curve with a mass-produced EV, the i-MiEV, which went on sale in 2009. 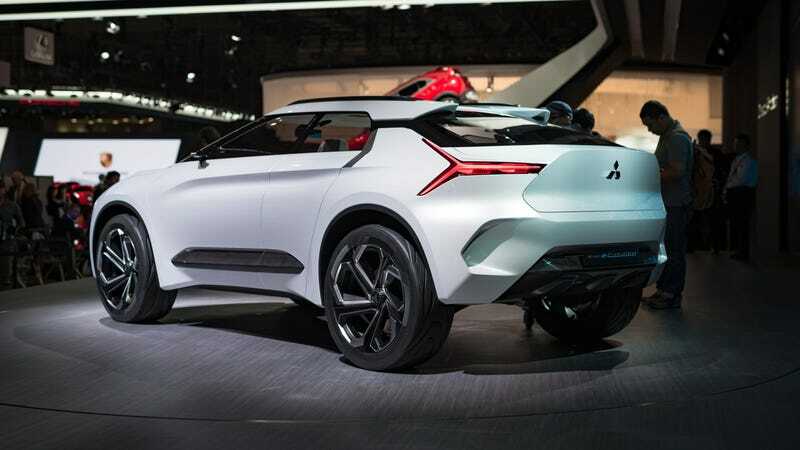 The e-Evolution is the combination of Mitsubishi’s “years of expertise” in the SUV and EV markets and indicates the direction for Mitsubishi in the near future. Since the last Tokyo Motor Show a lot has changed; Mitsubishi is now under the Renault-Nissan Alliance (after a scandal forced it there) and have some proper R&D resources to play around with. So it’s not a Lancer Evo, but it is what’s next. This “Performance EV SUV” will be powered by three electric motors; one at the front and two at the rear. It’ll have torque vectoring Dual Motor Active Yaw Control and what the company calls “adaptive response characteristics.” On paper, it all sounds very impressive. But excuse me for having trouble swallowing the hype. This is still Mitsubishi we’re talking about, the same company that’s been making the same Lancer for over a decade now. The same company that hasn’t had a new Pajero since before the iPhone was invented. (You don’t get that anymore at all, but it’s a huge deal in other markets.) And the same company that killed off the Lancer Evolution only to use the “Evolution” name on an EV SUV concept, all while longtime rival Subaru—a smaller company—keeps the rally car fires burning. Then there’s the design. The proportions of the car look decent enough, there’s short overhangs and an aggressive stance. But the front end with the exaggerated “Dynamic Shield” makes it look like a Citroen mixed with a bit of the Lamborghini Urus. Sure, the latter isn’t a bad thing, but it just sort of lacks originality. But the more I thought about it, the more I realized there’s potential here for this new electric Mitsubishi. Perhaps the company’s onto something with the e-Evolution. If we’re to believe the theme at the Tokyo Motor Show and the world truly is going towards EVs, autonomy, and AI, then Mitsubishi should also evolve and just concentrate on making EV SUVs and crossovers. It could beat others to the market, just like it did with the i-MiEV. It’s not that far-fetched with the help of the Renault-Nissan Alliance. As much as we’d all love to see a new Lancer Evolution, or at least a successor to it, SUVs and crossovers sell. Something like the e-Evolution, or even a smaller sized crossover, could be the turning point for Mitsubishi. It might be more important than an Evo sedan—it just might make them relevant again. Then, again there have been many concept cars in the past and many promises made, and all they have to show for it is the Eclipse Cross. The game is new and changing for everyone. We’ll see if Mitsubishi can navigate it.